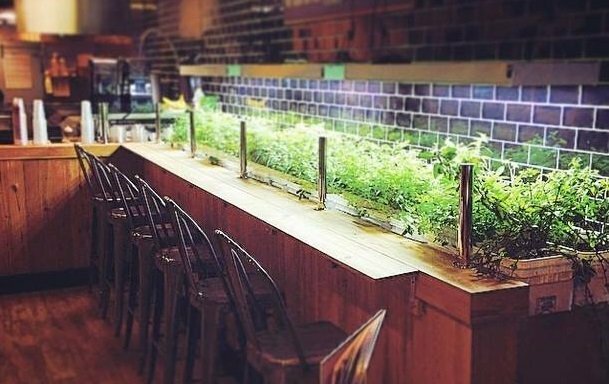 Indoor gardening is a great idea for an establishment with limited outdoor space and desire to grow all year round. GCG installs and maintains indoor growing systems for businesses, restaurants, schools and other establishments. Work with our professional design team to develop an indoor growing system that best fits your growing desires and the indoor space that you have. We will install artificial lighting systems and irrigation systems that will allow your crops to thrive. Certain crops will grow better indoors than others. Most herbs, including cilantro and mint, will actually do well with less sunlight. Compact plants like lettuce, carrots and radishes will grow, although they will do so more slowly than outside. You will certainly want to pay extra attention to the amount of light your plants are getting. Fruiting plants like tomatoes and peppers will almost certainly require additional artificial light in order to prosper. Living walls are vertical growing structures installed both indoors and outdoors in homes, schools, restaurants and workplaces that bring a little bit of the garden inside. 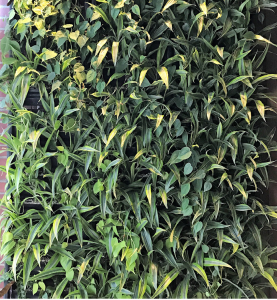 Green City Growers (GCG) works with several types of living wall infrastructure systems, and our design team can recommend the best system for your location. The systems we install and maintain draw on biophilic design and strive to mimic natural systems that thrive and are self-sustaining and self-regulating. regular maintenance of these systems to keep them healthy and looking their best. To help out the maintenance process, water your plants as you would outside, though pay keen attention to soil moisture. Because air indoors tends to be drier, the soil will likely dry out faster than it would normally. Pests pose a smaller issue than they do outdoors, though you may occasionally stumble upon mites, whiteflies, mealybugs or aphids. 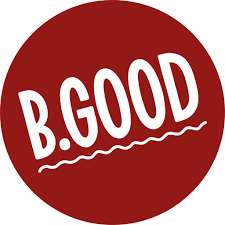 GCG has installed most a dozen indoor growing systems at various B.GOOD locations in the Boston area. 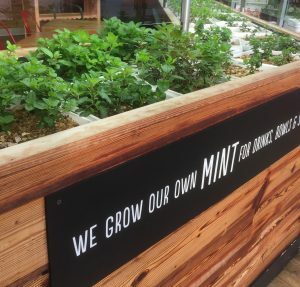 We designed a system with milk crates and grow lights that produce various herbs the restaurant uses for their dishes year round!